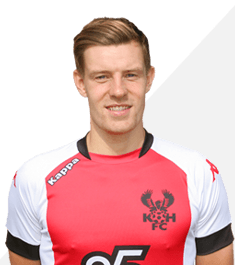 The highly rated Nuneaton striker Joe Ironside signed for the Harriers in the run up to the end of the 2016-17 season in a bid to get us over the play-off line. He started his career with Sheffield Utd and was sent out on loan to Alfreton Town amongst others. He finally signed for Alfreton on his release from Bramall Lane and then joined Nuneaton just over a year later. Joe is the son of former Middlesbrough goalkeeper Ian Ironside. He signed for the Harriers for an undisclosed fee – thought to be around £25.000 – on a one year contract. He soon started to bang in the goals even though his pace wasn’t the best out there. Most of them coming from his head but in November 2018 he went to York City on loan until January 7th 2019 along with Kennedy Digie after losing his starting place in the team.